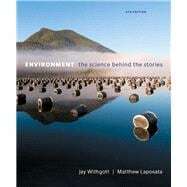 For courses in introductory environmental science. Environment: The Science behind the Stories is a best seller for the introductory environmental science course known for its student-friendly narrative style, its integration of real stories and case studies, and its presentation of the latest science and research. The 6th Edition features new opportunities to help students see connections between integrated case studies and the science in each chapter, and provides them with opportunities to apply the scientific process to environmental concerns. Mastering ™ Environmental Science is an online homework, tutorial, and assessment system designed to improve results by helping students quickly master concepts. Students benefit from self-paced tutorials that feature personalized wrong-answer feedback and hints that emulate the office-hour experience and help keep students on track. With a wide range of interactive, engaging, and assignable activities, students are encouraged to actively learn and retain tough course concepts. Note: You are purchasing a standalone product; Mastering ™ Environmental Science does not come packaged with this content. Students, if interested in purchasing this title with Mastering Environmental Science, ask your instructor for the correct package ISBN and Course ID. Instructors, contact your Pearson representative for more information. Environment: The Science behind the Stories , 6th Edition is also available via Pearson eText, a simple-to-use, mobile, personalized reading experience that lets instructors connect with and motivate students — right in their eTextbook. Learn more. Jay Withgott is the primary author and has been with the book since the first edition. He is a seasoned science writer. Matt Laposata teaches at Kennesaw State University, where over 4000 undergraduates take the Introduction to Environmental Science course each year. Matt brings a fresh, teaching¿-based perspective to the book thanks to his classroom experience. Matt’s research interests are in science education and he has been a part of several NSF-funded projects specifically aimed at improving environmental science education.